There are lots of pens available on the market today, created from many different materials. These pens have moved away from the designs you might expect and have turned into multi-functional tools. Light-up and shine pens are excellent for tradeshow displays and event marketing since they attract attention and drive visitors to your booth. How to Get Started with Promotional Pens? Personalized pens are a breeze to carry and promote everyday. Just drop them at the local businesses you visit. These personalized pens are as unique as you are, and are often offered in a number of colors for the same style. 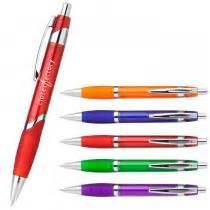 Whether you have a business, organization, or school there is a color of pen that will your schools official colors. Pens are simple to carry and, due to this, your message is going to be carried on it. These pens are often kept for a long time, and their presence makes them ideal for advertising and gifting. Such pens might be used for certain purposes and activities that revolve around a specific concept, service or product. For example for a product launch these giveaways can be offered to the attendees together with various items to help make the event more memorable. Pens are some of the cheapest promotional products around. The specific type of pen that is suitable for your branding effort along with what your target audience would like to receive also has to be considered when shopping. It's crucial to do some research to determine the best option and if you'd like, we'll do the product sourcing for you. On the positive side, they are ideal for businesses with tight funds for an event. Pens are extremely inexpensive, easy, and appealing promotional item and giving them out as a present to clients ought to become part of any solid advertising strategy. There are high end options with an executive appearance but they are available in a massive selection of unique sizes, styles, designs, and colors, therefore it is simple that you choose the right option for your situation.